The Slash Brain Storm is a board we knew really well a few years ago and even owned. Getting back on the 2019 Slash Brain Storm was pretty similar to the old ride in terms of shape and camber profile but the materials seemed a bit different. It didn’t feel as stiff as it used to be and felt like a better more dynamic board that does better in uneven snow than before. The minimal camber isn’t ideal for hard carving or really aggressive turning but it’s a very recommendable board for those that like easy float, a forgiving ride and strong edge hold at a reasonable price. Conditions: Pretty good mid winter snow. The Slash Brain Storm is new this year and to us it feels like a more mellow, softer quicker turning version of the Jones Mountain Twin. Like the Jones it’s a very playful versatile forgiving all mountain board that has exceptional float in powder. It’s also got that all condition consistency that helps make you a better rider. This is a great entry level all mountain board but also can be fun for advanced to expert level riders that prefer a more playful than aggressive ride. 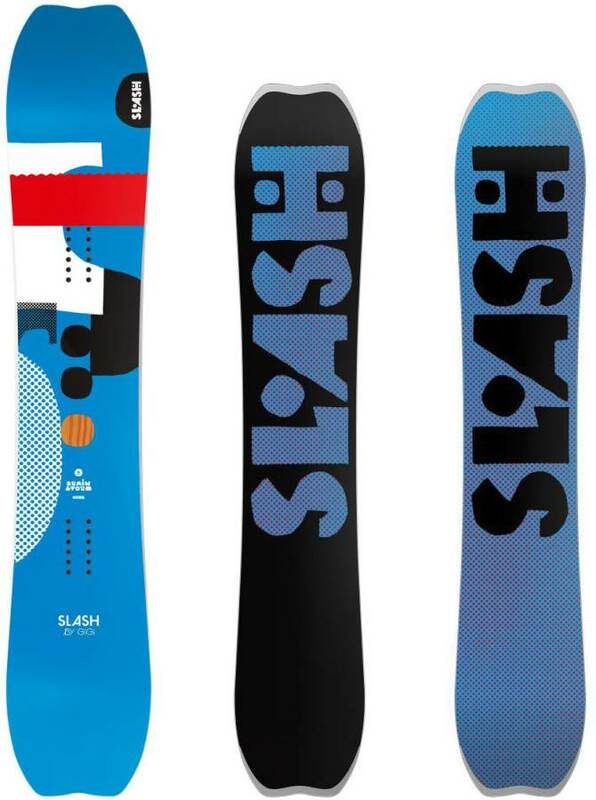 The 2016 Slash Brainstorm is very similar to the 2015 except it comes in mid/wide to wide this year. Conditions: Hard snow, medium snow and soft to slushy snow. The Slash Brain Storm’s got the same set back hybrid camber as the Jones Mountain Twin but it’s just got a little less camber between the feet. What that does is make it more freestyle playful and more buttery but as a result, it’s not quite the same fun experience as the Mountain Twin on a carve. On Snow Feel: Very stable forgiving and consistent ride that has the same feel underfoot no matter what condition or terrain you are in. Not many boards can claim that. Usually, a lot have a weakness in certain types of conditions like powder or hard snow but this doesn’t. It’s not the cheapest entry level board but it’s also the kind of board that can keep progressing with you as you develop from a beginner to expert rider. It’s easy to one foot off a chair and flat base on long cat tracks. It just says take me anywhere you want to go. Turn Initiation: Even when we (mostly medium binding riders) had large bindings on this board it still turned easy. When I got medium bindings on the board it was on. It’s super snappy and quick edge to edge and turns without much effort. It’s a good board to have underfoot in a tight spot. Medium to wider radius turns aren’t as fun as quick short radius turns but they aren’t lacking either. Flex: So on snow, the extra rocker with minimal camber between the feet makes it pretty to easy to butter and it doesn’t seem as stiff on snow as it seems in the shop. It feels medium bordering on med/stiff in the shop but on snow, the Slash Brainstorm feels medium across the board. Edge Hold: Whatever is going on with the sidecut works. It holds an edge really well. It holds well between the feet and it can even handle a little ice. It’s not a super strong ice board though. It’s just comfortable and confident on the hard ice. You don’t feel it grab or stick to thick snow. Powder: This directional rocker/set back camber really makes for an easy floating board. Also, the set back on board is pretty good at almost 32mm (1.25″). It’s right up there with many freeride boards we tried without the more aggressive flex. It’s a great board to learn to ride powder on or try new things in powder. Even a centered stance isn’t bad when it comes to switch powder riding but its strong point is a directional float. It’s got the similar float to the Jones Mountain Twin but turns faster in the trees. Carving: Not quite the carving board of the Jones or other hybrid camber boards with more camber but you can get a hard turn in. The thing with the smaller camber requires you to keep the pressure between the feet and pretend you are on a smaller board. Setting this board back over the camber more makes it better when it comes time to carve but centered isn’t bad either. Speed: You can feel a little more chatter than you can with the Jones Mountain Twin. It’s nothing terrible but it’s just not designed to be a bomber board. It’s more of a playful look for features kind of board as opposed to a get to the bottom first kind of board. Uneven Terrain: So easy over bumps and uneven terrain when it’s time to slow down. Going over or turning around moguls is super easy. Switch: Now it’s not perfect but centered up you can easily learn to ride switch. The only real difference you feel is when you butter switch compared to regular as the tip has more rocker than the tail. Jumps: Boards with this little camber usually don’t have much pop but Nidecker/Slash figured out a way to squeeze an extra bit of mustard into this design to make this board pop really well. It’s not the kind of board we’d like to hit a big kicker on but small to medium sized kickers are very easy to approach and land. It’s got a great pop for such a forgiving mellow board and it excels in the small to medium category. Jibbing: This isn’t a bad jib board at all for an all mountain board. Usually, that’s the weakest spot and while this isn’t a jib board stand out it’s easier than many all-mountain boards here. Pipe: This is an outstanding entry level pipe board as well as a really fun pipe board for those that don’t like to go super big. It’s easy going from wall to wall and also a nice easy ride to learn new things when in the taco. All in all this Slash Brain Storm is a nice board for entry-level to expert riders that want a playful one board quiver. We try to get as many images of the Slash Brain Storm, but forgive us if they're not all there. Love this board took it away for week in Austria with lots of powder and groomed slopes...ideal for intermediate or advanced rider ...very forgiving considering the camber, however the raised edges do negate this....loved the stability at speed on low sped groomers.....not the board for the park however with set back binding posns and stiffer rear end..my only bug bear is the edges are starting to come away already at front and rear of the board after only one week..appears the board once it lets a little moisture in to the edges will allow glue and resin to lift..
Got this board for the 16/17 season, went once last year and loved it so got all new gear and a season pass for my local hill. I've been on it about 12 times now and already feeling very confident. This board has progressed my ability's from rolling down the hill to now being able to ride switch and hit a 180 of a kicker. The board carves great set back or centered up. Switch was pretty hard to learn when i had it set back, but when i brought it forward it felt pretty much even both ways. Overall great progression board for beginners. Height, Weight And Boot Size (for Boards, Boots & Bindings): 5'9" 160lbs 8.5 boots, Flux DS Med. I learned to ride on a 2011 Rossi Trickstick, and then ended up buying a 2016 Rome Tour based on a number of recommendations from thegoodride and other sources. I did not like the ride of the Tour at all, and eventually arrived at the conclusion that the flat-to-rocker profile with the turned-up nose and tail side edges was causing the feel that I didn't like. The board felt squirrely and loose. After James convinced me that the problem was the board, not me, I decided to go for the Brainstorm. What a great choice. I can link my turns on all green terrain and some blue, although I have to skid my turns on the steeper blues because my confidence level just isn't high enough yet. The Brainstorm is definitely a confidence booster and over this past weekend at Mt. Bachelor and Mt. Hood, I feel like I became a better rider, whereas in December at Steamboat I felt like I regressed on the Tour. The Brainstorm just smashed through the fresh powder at Bachelor, and the difficulty I had was me not knowing how to ride in those conditions. When I did ride it properly for moments, it felt glorious. The next day on packed powder was just as good. The Brainstorm feels stable off the chair, stable and easy to turn on the runs, and very comfortable flat-basing or charging hard in a straight line to maintain speed for an upcoming flat or uphill portion. I did not feel this way on the Tour at all.